From former student activists and a monk escaping persecution, to a politician’s son and a typical teenage girl caught in a bad situation, the people who reside in refugee camps along the Thai-Burma border are a cross section of the Burmese population. The young and old from differing backgrounds await different dreams for the future. But one thing they all have in common is that they are waiting for the day when they can leave the camps and never look back. 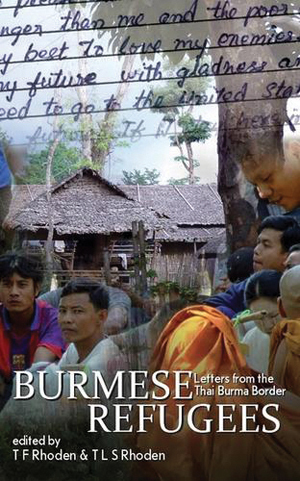 “Burmese Refugees” is a collection of essays written by individuals living in a refugee camp at the Thai-Burma border. The essays were written as an assignment for an English class held in the camp. Students were asked to write about their past to practice formulating sentences in the past tense. Instructor T. F. Rhoden was blown away by the resulting stories. The tales are straightforward and simply stated. Some students had been directly involved in Burma’s most recent protests in 1988 and 2000, while others had family ties to these protesters. Some were escaping human rights abuses due to their ethnicity. Their respective journeys to the camps were intense, filled with fear and anxiety, but most just said they had to flee. Nothing more. Nothing less. That was the understood reality in Burma under military control. I thought this as well, as the bleak conditions in the camps — some residents weren’t even allowed rations since they hadn’t been living there long enough — are very important for readers to see. As Americans, we complain about not being able to afford the latest tech gadget and we enjoy watching reality TV shows that encourage extravagant, excessive lifestyles. Getting a glimpse of these people’s reality is very important to remind us how lucky we are and to remember that not everyone can live like we do. And also to remember we have the resources and ability to help. In the winter of 1954, the people of San Piedro Island gather in a courtroom in the Island County Courthouse. They watch Kabuo Miyamoto stand trial for the murder of one Carl Heine. Before the incident, both men had been long-standing members of the community. As a result, it is no surprise to find the courtroom packed with island residents anxiously waiting to see what unfolds. But as the trial moves along, it’s clear that more than just Miyamoto’s guilt is at stake. 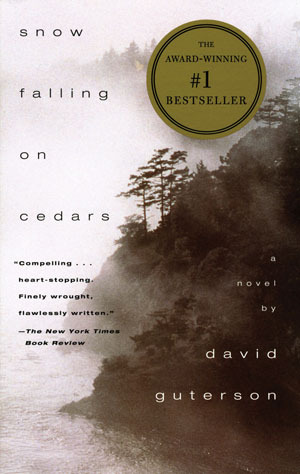 Told through flashbacks from the past and moments throughout the trial, “Snow Falling on Cedars” takes us through the ups and downs of an island community located just north of the Puget Sound – a location so small and isolated that everyone knows everyone else’s business. And throughout each character’s story, there is the shared memory of World War II and the events that unfolded leading to the Japanese residents’ exile, while the rest of the island watched, thinking it was the right thing to do. What I liked about “Snow” was how rich and detailed Guterson’s descriptions are. From the opening courtroom scene and the surrounding natural environment, to the characters’ physical appearances and their mannerisms, Guterson is so thorough that you can place yourself in the scene. There is also a true feeling of community — the good and the bad — throughout the story. From the flashbacks of the now grown-up characters as children playing with other children, to the familiar way the characters address each other, readers get the sense that they’ve stepped into the middle of Small Town, USA. I also enjoyed the story’s many facets. It’s a ‘whodunit’ mystery, an account of two very different groups and their attempts to cohabitate on a small island. It’s a love story between two people from different backgrounds and a tale of a community in the aftermath of a war. Until the age of 11, Arn was like any other kid in his home village of Battambang, Cambodia. He went to school (though he probably spent more time figuring out how to ditch class), terrorized his sisters with his little brother, hustled for spare change, and sold ice cream in town. But then soldiers from the Khmer Rouge came into town and marched everyone to the countryside, where they worked in labor camps. Families and friends are torn apart as people are forced to different camps throughout the war-torn country. People die every day from illness and exhaustion. And if that doesn’t get them, then the Khmer Rouge will. The soldiers kill anyone who shows even the slightest hint of rebellion or those suspected to have been wealthy or educated during their former life. Arn witnesses all of this as a resident of these different camps. But somehow, he manages to survive, sneaking extra food here and there and sharing it with the other kids. 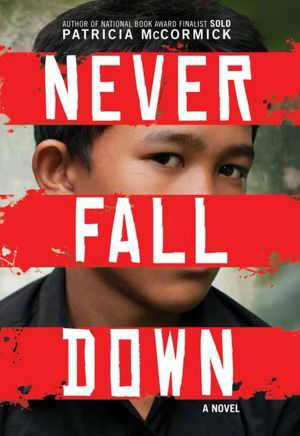 “Never Fall Down” is based on the true story of one man’s experiences in the Killing Fields as a child — how he blindly volunteered to join a Khmer Rouge band, which saved his life. Arn befriended a kind soldier in the camp and became a child soldier himself in order to survive. Arn’s story gives us a firsthand account of what life was like during Cambodia’s darkest times. Some of his experiences seem too horrific to be true, and yet, they really did happen. While this sometimes makes the story difficult to read, I think it is important for readers to see this. As a second generation Cambodian American, I have family members who lived through this, and reading about Arn made me feel closer to them.